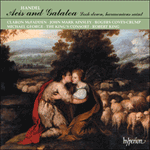 Acis and Galatea was one of Handel’s most popular works, revived no fewer than eight times and performed at least seventy times by the middle of the century. It was also one of the few large scale-works to remain popular after his death: Mozart re-orchestrated it in 1788 for the celebrated concerts of music organized by van Swieten, Mendelssohn performed it in 1828, and Meyerbeer even planned a staged performance of it in 1857. It was in fact Handel’s second setting of the myth, for the first, a serenata entitled Aci, Galatea e Polifemo, had been composed in Naples in 1708, probably for the wedding of the Duke of Alvito. We know little of the first performance of the Masque, which was a private affair at Cannons, other than a letter from Sir David Dalrymple to the Earl of London in May 1718 which mentions Handel being at work on a ‘little opera’. A manuscript of the score was included in a catalogue of the Duke’s music library made in 1720, and although Handel’s ‘conducting score’ of 1718 does not survive, several contemporary manuscripts do, including one in the British Library. Acis and Galatea is first mentioned as being a ‘Masque’ in the Duke’s catalogue of 1720. The heyday of the form had been nearly a century before when mime, music, dancing, spoken dialogue and lavish spectacle had been combined by figures such as Ben Jonson and Inigo Jones to make court entertainments of great splendour. The Masque never again recaptured the full glory of its Elizabethan form, but it did continue to serve as entr’actes in plays and operas for many years. In early eighteenth-century London the form recurred, partly as a home-grown reaction against the increasing popularity of Italian opera. Mostly these masques were short operas on pastoral or mythological subjects, usually divided into two ‘interludes’ or ‘entertainments’, and Handel would certainly have had first-hand experience of the work of two principal providers, the composer Pepusch and the poet John Hughes. The story comes from Dryden’s translation of the thirteenth book of Ovid’s Metamorphoses, which appeared in London in 1717. In a libretto of 1730, Alexander Pope is named as the author of Handel’s text, but in one of 1739 John Gay is credited; the words of the aria ‘Would you gain the tender creature’ are certainly by John Hughes. As Handel would have known the three poets through Lord Burlington’s circle it would not be unreasonable to suggest that all three may have had a hand in the libretto: such a practice was not uncommon. Throughout the masque the chorus plays an important role, setting the scene, observing and commenting, and ultimately even participating in the action. Not since Purcell’s Dido and Aeneas had it been so inextricably bound up with the drama. After a splendid Overture the scene opens on ‘a rural prospect, diversified with rocks, groves and a river’ and the chorus sets the happy scene of Arcadian bliss. Only the sea nymph Galatea is unhappy, and in ‘Hush ye pretty warbling choir’, delightfully scored for sopranino recorder and upper strings, she pines for her beloved Acis and rebukes the birds. However, unknown to Galatea, Acis too is distracted by love, and in ‘Where shall I seek the maiden fair?’ comes across as suitably youthful and impetuous. Damon is the rational element, worldly-wise and always advising caution. Here he reminds Acis that he is neglecting his shepherdly duties: there is plenty of time for such passions. But Acis is not listening, and Damon’s attempts to keep up with him are portrayed in the running bass line of ‘Shepherd, what art thou pursuing?’. The pace relaxes with the siciliano ‘Love in her eyes sits playing’ and Galatea’s elegant minuet ‘As when the dove’, before young love can wait no longer, and the lovers finally meet in the breathless duet ‘Happy we’. Act Two increases the pace of the drama: the foreboding opening of the chorus ‘Wretched lovers’ is overtaken by the arrival of ‘the monster Polypheme’ whose enormous strides and thunderous voice are graphically portrayed in yet another change of mood. Of the four characters, it is the monster Polyphemus who is the most complex, for we are left unsure whether to take him seriously or not. Handel portrays him with more than a note of humour and certainly as being larger than life: at the same time as being a pathetic failure, the monster’s behaviour is horrific. This contrast is shown between the recitativo accompagnato ‘I rage, I melt, I burn’ (which parodies moments of similar tension in opera seria), and the following aria ‘O ruddier than the cherry’ which goes to the opposite extreme, earnestly tuneful and incongruously delicate, with a monster who has just demanded ‘a hundred reeds of decent growth to make a pipe for my capacious mouth’ accompanied by the smallest instrument in the orchestra, a sopranino recorder. Love has temporarily reduced Polyphemus to a gentle giant. But the humour does not last, and Galatea’s abrupt dismissal of him ‘Go monster, bid some other guest: I loathe the host, I loathe the feast’ brings on impatience. Polyphemus does not even wait for the orchestra’s opening ritornello in ‘Cease to beauty to be suing’. Damon urges Polyphemus to try the soft approach in the charming aria ‘Would you gain the tender beauty’, but Acis is already preparing for combat in the military ‘Love sounds the alarm’ (no need for trumpets here: Handel uses the oboe and strings to great dramatic effect). Damon once again tries the cautious approach, with a liltingly pastoral aria ‘Consider, fond shepherd’, and Galatea begs Acis to trust her constancy. But the couple can wait no longer, and Handel is able to employ a movement of great drama with the gentle duet ‘The flocks shall leave the mountains’ subjected to Polyphemus’s ferocious interruptions. Here we are left in no doubt that we have a none-too-intelligent brute with murder on his mind. Already furious at his failure to woo Galatea, Polyphemus cannot cope with the scene he now sees in front of him. He exacts his furious revenge by crushing Acis beneath a stone, and Acis, crying for help in a highly charged chromatic accompagnato, dies. The chorus laments his death in ‘Mourn all ye muses’, and Handel uses the unaccompanied consort of voices particularly effectively at ‘The gentle Acis is no more’. Galatea mourns her loss, and it is the chorus who advises Galatea to invoke her divine powers. After a particularly poignant recitative she immortalizes Acis in the deliciously scored aria ‘Heart, the seat of soft desire’. Two treble recorders and gently undulating strings provide an exquisite texture: Galatea has turned Acis into a fountain. But it is left until the middle of the aria for the moment of magic. Galatea commands: ‘Rock, thy hollow womb disclose the bubbling fountain’ and (almost disbelieving her own power), ‘Lo! it flows’. All that now remains is for the chorus to end the work: Galatea is told to dry her tears, for the murmuring stream that flows out across the plain still speaks of their love. The Sinfonia from Handel’s Acis and Galatea (HWV49) sets the scene recreating a magical evening at the gardens. Acis and Galatea was written in 1718 for James Brydges, Earl of Carnarvon and later Duke of Chandos to be performed at Cannons, his unfinished country residence in Middlesex. This original and extremely popular English version had various incarnations including a reworking as an Italian serenata. 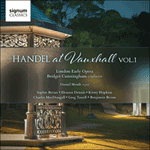 Later revisions reverted again to the all-English Cannons version including one in 1739 with added violas and carillon and a final revision in 1742 when Handel worked in Dublin and again used different instrumental forces, this time without a carillon. Chorus: Oh, the pleasure of the plains! And flow’rs display their hue. Too faint the gales, to cool my love. Air Galatea: Hush, ye pretty warbling quire! Bring back my Acis to my sight! Hush, ye pretty warbling choir! Hush ye pretty warbling choir! is from the first Act of Acis and Galatea when a semi-divine nymph, Galatea, is in love with the shepherd Acis and tries to gently hush the birds that ignite her passion for him. In 1737 the new organ had been installed at Vauxhall and later on had new mechanisms added to it including a much admired ‘symphony of singing-birds’ and a carillon, which were possibly heard for the very first time in a widely reported programme of 7 May, 1739. This was an occasion in which the Prince of Wales visited the Gardens and Hush ye pretty was played on the carillon, accompanied by the ‘artificial birds. As far as we know, no English organ has survived with an integral carillon or birdsong machine, like in this organ at Vauxhall. Air Acis: Where shall I seek the charming fair? Direct the way, kind genius of the mountains! O tell me, if you saw my dear! Seeks she the groves, or bathes in crystal fountains? Recitative Damon: Stay, shepherd, stay! See, how thy flocks in yonder valley stray? Air Damon: Shepherd, what art thou pursuing? Share our joy, our pleasure share! Lo! here my love: turn, Galatea, hither turn thy eyes. See, at thy feet the longing Acis lies! And warbling in her breath! Acis would ne’er from Galatea rove. Duet Galatea & Acis: Happy we! Of all youths thou dearest boy! Of all nymphs thou brightest fair! Thou all my bliss, thou all my joy! This sad decree: no joy shall last. Wretched lovers, quit your dream! See what ample strides he takes! Hark, how the thund’ring giant roars! I rage, I melt, I burn! The feeble god has stabb’d me to the heart. Prop of my godlike steps, I lay thee by! To make a pipe for my capacious mouth. Sweet Galatea’s beauty, and my love. In ‘I rage, I melt, I burn!’—‘O ruddier than the cherry’ (from Acis and Galatea, Cannons, 1718), Polyphemus’ attempt to be seductive is implausible and amusing. The monster cannot control his raging lust for the sea nymph Galatea (who is in love with the shepherd Acis), although the accompanied recitative ‘I rage, I melt, I burn!’ veers between fury and a hint of melancholic suffering that any unrequited lover can identify with. Calling for a wind instrument to be made for him from ‘a hundred reeds of decent growth’, he intends to serenade Galatea. Dans «I rage, I melt, I burn!»—«O ruddier than the cherry» (tiré d’Acis and Galatea, Cannons, 1718), la tentative de Polyphème d’être séduisant est invraisemblable et drôle. Le monstre ne peut contenir son désir furieux pour la néréide Galatée (éprise du berger Acis), même si le récitatif accompagné «I rage, I melt, I burn!» oscille entre cette furie et ce soupçon de souffrance mélancolique que reconnaîtront tous ceux qui vivent un amour non partagé. Exigeant qu’on lui fabrique un instrument à vent à partir d’«une centaine de roseaux de taille respectable», il veut donner la sérénade à Galatée. Die Verführungsversuche des Polyphemus in „I rage, I melt, I burn!“/„O ruddier than the cherry“ (aus Acis and Galatea, Schloss Cannons 1718) muten unbeholfen und komisch an. Der Riese kann sein rasendes Verlangen nach der Meernymphe Galatea (die den Schäfer Acis liebt) nicht bändigen, auch wenn das Accompagnato-Rezitativ—„Ich ras, ich schmelz, ich brenne!“—zwischen Zorn und einem Anflug von melancholischem Leiden schwankt, mit dem sich jeder unglücklich Verliebte identifizieren kann. Polyphemus verlangt, dass man ihm ein Blasinstrument aus „hundert gut gewachsenen Rohren“ baue, damit er Galatea ein Ständchen bringen kann. Accompagnato Polyphemus: I rage, I melt, I burn! The accompanied recitative ‘I rage, I melt, I burn!’ veers between fury and a hint of melancholic suffering that any unrequited lover can identify with. Calling for a wind instrument to be made for him from ‘a hundred reeds of decent growth’, he intends to serenade Galatea, but Handel’s humour pokes affectionate fun at the psychotic Cyclops by making the supposedly huge ‘pipe’ into a tiny high-pitched sopranino recorder, ideal for the witty caricature of clumsy attempts at love poetry (‘O ruddier than the cherry’). Le monstre ne peut contenir son désir furieux pour la néréide Galatée (éprise du berger Acis), même si le récitatif accompagné «I rage, I melt, I burn!» oscille entre cette furie et ce soupçon de souffrance mélancolique que reconnaîtront tous ceux qui vivent un amour non partagé. Exigeant qu’on lui fabrique un instrument à vent à partir d’«une centaine de roseaux de taille respectable», il veut donner la sérénade à Galatée, mais l’humour de Haendel moque tendrement le cyclope psychotique en faisant du «pipeau» censément énorme une minuscule flûte à bec sopranino aiguë, qui se prête merveilleusement à la verveuse caricature des maladroites tentatives de poésie d’amour («O ruddier than the cherry»). Der Riese kann sein rasendes Verlangen nach der Meernymphe Galatea (die den Schäfer Acis liebt) nicht bändigen, auch wenn das Accompagnato-Rezitativ—„Ich ras, ich schmelz, ich brenne!“—zwischen Zorn und einem Anflug von melancholischem Leiden schwankt, mit dem sich jeder unglücklich Verliebte identifizieren kann. Polyphemus verlangt, dass man ihm ein Blasinstrument aus „hundert gut gewachsenen Rohren“ baue, damit er Galatea ein Ständchen bringen kann; Händel aber macht sich mit gutmütigem Humor über den liebestollen Zyklopen lustig, indem er das angeblich so riesige Instrument in eine piepsende Sopranino-Blockflöte verwandelt, die sich im Folgenden herrlich für eine geistreiche Parodie auf unbeholfene Liebesverse eignet („Du roter als die Kirsche“). Still my warm embraces shunning? Proud to be gather’d by thy hand. And swill full draughts of human blood! I loathe the host, I loathe the feast. Let the brave their aims pursuing. Still be conqu’ring, not complaining. Suff’ring is the lover’s part. Weak as I am, I must engage! In pursuit of the fair! The pow’rs propitious still to love! Ere I forsake my love! Polyphemus: Torture! Fury! Rage! Despair! As these dear smiles to me. Polyphemus: Fly, swift, thou massy ruin, fly! Accompagnato Acis: Help, Galatea! Help, ye parent gods! Chorus: Mourn, all ye muses! Weep, all ye swains! Tune, tune your reeds to doleful strains! Ah, the gentle Acis is no more! Inglorious crush’d beneath that stone? Chorus: Cease, Galatea, cease to grieve! Bewail not whom thou canst relieve. The goddess soon can heal thy smart. Galatea: Say what comfort can you find? For dark despair o’erclouds my mind. Through verdant plains to roll his urn. Be thou immortal, though thou art not mine! Be thou now a fountain bright! Rock, thy hollow womb disclose! Murm’ring still his gentle love.